If you’re struggling to manage your finances, you’re not alone. Consumer debt rose 7.6 percent between 2017 and 2018 to almost $4 trillion. With only about one third of Americans maintaining a personal budget, it’s no wonder that so many are in debt. The first step toward getting a better handle on managing your money is learning how to budget. What Is a Budget and Why Should You Have One? A budget is a financial plan for balancing your income and your spending. Budgeting effectively can help you take better control of your money, and it can be quite simple. The most typical form of budget is a monthly plan. When you use a monthly budget, at the beginning of each month, you’ll determine how much money you plan to make and how much you want to spend. By knowing what’s coming in and what’s going out, you can more effectively plan for the future. This means you’ll spend and save with purpose, giving you greater financial freedom: more of what you want, and less of what you don’t need. Budgeting can help you achieve your financial goals by providing clarity on where your money is going, and after you learn how to manage your money effectively, you’ll end up spending less frivolously and saving more for long-term and more important goals, like building up an emergency fund. In other words, you can gain true financial freedom when you know how to budget well. And all it really takes is following a few effective budgeting tips. The first step to creating a budget is figuring out your monthly income. You can even do this with a simple pen and paper. How much money do you expect to make next month? Calculate your total and write it down. You might want to look at what you made in previous months in order to be as accurate at possible. Remember that every month could be different, so you want to make sure you review your expected income every time you sit down again to budget. Eventually, if you budget correctly, you’ll have money saved from previous months to help you pay off next month’s expenses, which means your budget will get increasingly easy to manage, and you won’t have to survive on paycheck to paycheck. After you’ve totaled your income, calculate your monthly expenses. Write down those expenses and their associated likely totals. You can begin by making a list of all the typical things you spend money on every month: mortgage or rent, insurance premiums, internet and phone bills, etc. These are what are called “fixed expenses,” meaning they’re usually the same amount each month. These totals can often be rolled over from budget to budget. Next, you’ll include expected “variable expenses,” or expenses whose totals change from month to month. These might include groceries, utilities, entertainment, and other miscellaneous expenses. It’s sometimes hard to be precise when figuring out the totals for variable expenses because they are, after all, variable. But you want to try to be as accurate as possible. Once you get started budgeting, you can often refer back to the previous month’s expenses in order to get a better idea about what to expect. It’s also not a bad idea to give yourself a little buffer room for unexpected expenses during the month. Now that you know how to budget using the most basic method, let’s look at a couple of the most popular and effective budgeting strategies. You want to set realistic financial and savings goals for yourself. This is best done by organizing and managing your finances through developed budgeting approaches. There are a few different strategies to doing this, but two of the most popular are the 50/30/20 rule and zero-based budgeting. The 50/30/20 rule separates your budget into needs, wants, and savings. Needs include necessities like housing, utilities, groceries, etc., and they should occupy half (50%) of your budget. Wants—such as shopping, entertainment, and dining out—will make up 30% of your budget, and the remaining 20% should be money you’ve saved. This popular rule helps by breaking your budget up into basic categories, giving you a better idea about where exactly your money is going. The 50/30/20 Rule was first coined by U.S. Senator and prominent bankruptcy lawyer Elizabeth Warren in 2005, and is now one of the most well-known strategies for budgeting. If the 50/30/20 percentage totals don’t make sense with your budget, you can always alter it to something like 80/20, where 20% of your income goes toward your financial goals and 80% is used for everything else. Zero-based budgeting, in some ways, is a more simple method. It was developed by Peter Pyhrr, an accounting manager for Texas Instruments, back in the 1970s. Originally intended as a strategy for companies to maximize financial efficiency, zero-based budgeting is great for managing personal finances as well. This strategy basically just means that your monthly income minus your expenses should amount to zero. So, if you earn $5,000 a month, you want to make sure that every dollar of that is going to paying for needs, wants, and savings. With zero-based budgeting, you have to make sure you know where every dollar is going in order to spend as wisely as possible. These are just two of the most popular budgeting strategies. There are several other ways to tackle your budget. Whatever strategy you choose, make sure to stay on track and stick to your budget, including paying close attention to both income and expenses. You don’t want to end up losing money with no idea where it went. If a pen and paper aren’t doing it for you, there are plenty of tools out there that can help you keep your budget on track. Lots of simple spreadsheets for your phone or computer (for Google Sheets, Excel, etc.) are available, and many are free. At Freedom Debt Relief, we offer a free and easy-to-use budgeting worksheet for immediate download. Other online tools and apps, like EveryDollar and Mint, are also helpful for managing your finances, and are usually very easy to use. Now you should feel like you have a basic understanding of how to budget. With these ten additional budgeting tips, you’ll be even closer to acing Budgeting 101 and mastering your financial future. People often spend more money in the present if they don’t have to pay it off until the future. This is bad news for your budget. If you have credit cards, try to break the habit of delaying—and enhancing—the consequences of spending by relying more on debit cards or cash. If you want to equalize your expenses and your income, paying with credit won’t help you do that. At the very least, you should account for all of your credit card payments in your monthly budget. When you put together your budget for the month, use a calendar to keep track of any upcoming events like birthdays, concerts, and anniversaries that may cause you to spend more than you would otherwise. If you don’t already have an event calendar, it’s easy to make one on your phone or computer (such as Google Calendar), or you can just use a paper monthly planner or calendar. When you know there are special occasions that might be coming up, you’ll be able to modify your budget to account for the extra expense. Take a moment to plan out your meals before going to the grocery store in order to more effectively manage your shopping list. When you plan your meals ahead of time, you won’t be tempted to just buy what looks good. You also won’t end up buying ingredients you might already have. Go to the store with a list, pick out what you need, and get on your way—in this way, planning meals will also save you valuable time. If you find it easier to break up your budget by week rather than month, go for it. This is an especially helpful budgeting tip for people who like to go to the movies a lot or attend a lot of concerts and plays but may not know about these events ahead of time. Structure your budget around your lifestyle. The point of a budget is that it works for you and your finances. Don’t fool yourself into thinking you’ll ace your budget every month. Leave some wiggle room in your budget. For your income, err on the lower end. And for expenses, plan to spend a little more than you think. This will help to provide some cushion if you end up under-earning or overspending on your budget, which happens to everyone from time to time. Try to organize most of your budgeting information—including receipts, utility bills, and pay stubs—in a single folder on your computer or an accordion file. When all your budgeting info is in one place, it makes it that much quicker and easier to complete your budget. One of the most helpful budgeting tips is to resist the temptation to spend when you know you shouldn’t. If you find yourself craving something that isn’t included in your present budget, plan to purchase it the next month so that you can include it in your future budget. And when you put off just immediately buying things you want, you’ll be that much more sure it’s a sensible purchase when you still want it a few weeks later. Remember: your budget is all about your goals. Don’t feel like you need to compare your financial situation to that of anyone else. Your budget is your business, and you want to come up with a personal financial plan that works for you. Figure out your goals, including long term. Where do you want to be, financially, in a year? In five years? Your budget is a way to help you accomplish the goals that are unique to your life. If you’re budgeting with your partner or spouse, communicate openly with each other. You can and should work together to make your budget workable. If you’re married, this is an especially important skill to develop with your spouse, since a key part of marriage is sharing financial responsibilities. You can even make budgeting together fun by making snacks or putting on some music when you sit down to budget. As important as it might be, budgeting is still a chance to spend time with your special someone, so try to make it enjoyable. And when you stick to your budget, congratulate each other—you’re in this together. It usually takes a few months to really get your budget on track. Don’t worry too much if things aren’t perfect the first or second time around. The more you practice budgeting, the better you’ll get. If you slip up, learn from your mistakes and focus on the next month. You can do this, and getting down on yourself will not help you accomplish your goals any faster. Check out these money saving tips. If you end up spending beyond your budget, don’t be too hard on yourself. Everyone mismanages their money at one time or another. Whether you’ve overspent on groceries, forgot about a bill, or had an unexpected expense, refocus on your financial goals. With a little effort, you’re always able to get back on track. If you find you’ve overspent, stop spending immediately and reexamine your budget. See if there are ways to amend your budget to balance out the overspending. For example, are there any categories in your “wants,” or nonessentials, that could be reduced or eliminated? You may also want to adjust next month’s spending to account for your overspending this month. Again, focus on reducing your spending on the least important items first, or think of additional ways you can increase the savings portion of your budget. You’re already on the path to a healthier relationship with money just by learning how to budget. If your budget reveals that your monthly debt expenses are greater than your income and you think you won’t be able to keep your debt from getting bigger and bigger each month, it may be time to get debt help. 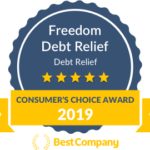 Freedom Debt Relief could help you figure out the best way to deal with your debt so you can get your finances back on track and have a healthier relationship with money. Call us now to find out how we could help, or download our free Debt Management Guide to learn about debt solutions that could help you.